Researchers from the Department of Energy’s SLAC National Accelerator Laboratory and Stanford University have for the first time shown that neural networks—a form of artificial intelligence—can accurately analyze the complex distortions in spacetime known as gravitational lenses 10 million times faster than traditional methods. “Analyses that typically take weeks to months to complete, that require the input of experts and that are computationally demanding, can be done by neural nets within a fraction of a second, in a fully automated way and, in principle, on a cell phone’s computer chip,” says postdoctoral fellow Laurence Perreault Levasseur, a co-author of a study published today in Nature. 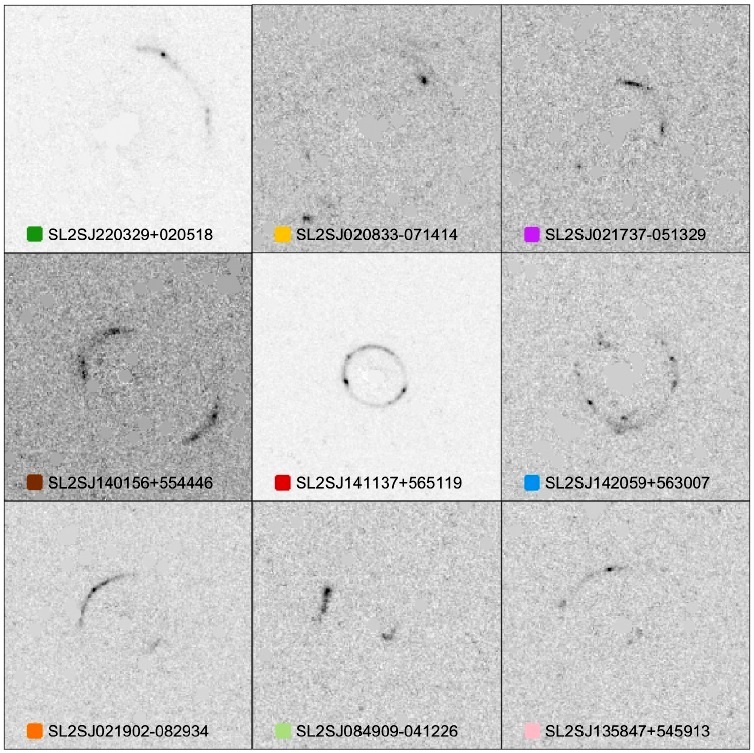 The team at the Kavli Institute for Particle Astrophysics and Cosmology (KIPAC), a joint institute of SLAC and Stanford, used neural networks to analyze images of strong gravitational lensing, where the image of a faraway galaxy is multiplied and distorted into rings and arcs by the gravity of a massive object, such as a galaxy cluster, that’s closer to us. The distortions provide important clues about how mass is distributed in space and how that distribution changes over time – properties linked to invisible dark matter that makes up 85 percent of all matter in the universe and to dark energy that’s accelerating the expansion of the universe. Until now this type of analysis has been a tedious process that involves comparing actual images of lenses with a large number of computer simulations of mathematical lensing models. This can take weeks to months for a single lens. But with the neural networks, the researchers were able to do the same analysis in a few seconds, which they demonstrated using real images from NASA’s Hubble Space Telescope and simulated ones. To train the neural networks in what to look for, the researchers showed them about half a million simulated images of gravitational lenses for about a day. Once trained, the networks were able to analyze new lenses almost instantaneously with a precision that was comparable to traditional analysis methods. In a separate paper, submitted to The Astrophysical Journal Letters, the team reports how these networks can also determine the uncertainties of their analyses. KIPAC researchers used images of strongly lensed galaxies taken with the Hubble Space Telescope to test the performance of neural networks, which promise to speed up complex astrophysical analyses tremendously. “The neural networks we tested—three publicly available neural nets and one that we developed ourselves—were able to determine the properties of each lens, including how its mass was distributed and how much it magnified the image of the background galaxy,” says the study’s lead author Yashar Hezaveh, a NASA Hubble postdoctoral fellow at KIPAC. This goes far beyond recent applications of neural networks in astrophysics, which were limited to solving classification problems, such as determining whether an image shows a gravitational lens or not. The ability to sift through large amounts of data and perform complex analyses very quickly and in a fully automated fashion could transform astrophysics in a way that is much needed for future sky surveys that will look deeper into the universe—and produce more data—than ever before. The Large Synoptic Survey Telescope (LSST), for example, whose 3.2-gigapixel camera is currently under construction at SLAC, will provide unparalleled views of the universe and is expected to increase the number of known strong gravitational lenses from a few hundred today to tens of thousands. Scheme of an artificial neural network, with individual computational units organized into hundreds of layers. Each layer searches for certain features in the input image (at left). The last layer provides the result of the analysis. The researchers used particular kinds of neural networks, called convolutional neural networks, in which individual computational units (neurons, gray spheres) of each layer are also organized into 2-D slabs that bundle information about the original image into larger computational units. Neural networks are inspired by the architecture of the human brain, in which a dense network of neurons quickly processes and analyzes information. 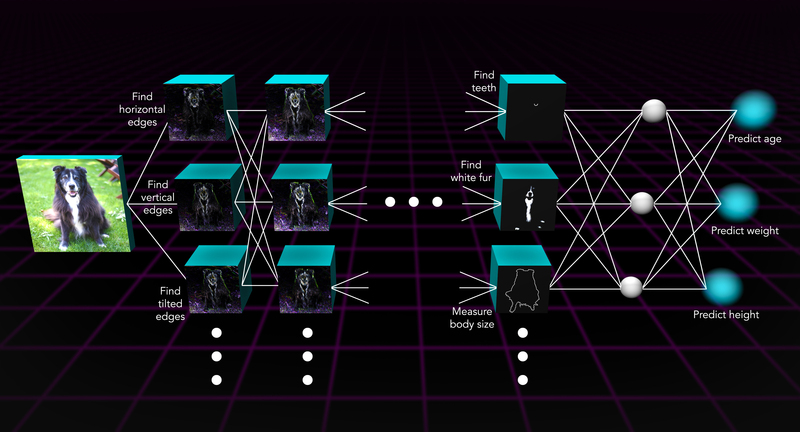 In the artificial version, the “neurons” are single computational units that are associated with the pixels of the image being analyzed. The neurons are organized into layers, up to hundreds of layers deep. Each layer searches for features in the image. Once the first layer has found a certain feature, it transmits the information to the next layer, which then searches for another feature within that feature, and so on. Although the KIPAC scientists ran their tests on the Sherlock high-performance computing cluster at the Stanford Research Computing Center, they could have done their computations on a laptop or even on a cell phone, they said. In fact, one of the neural networks they tested was designed to work on iPhones. Editor's note: This article originally appeared as a SLAC press release.